An adaptation of the revolutionary first person shooter computer game, Doom is mess of muddled action and bad science. It's the year 2046, and there is trouble on a Mars research facility accessed through an "Ark" portal in Nevada. 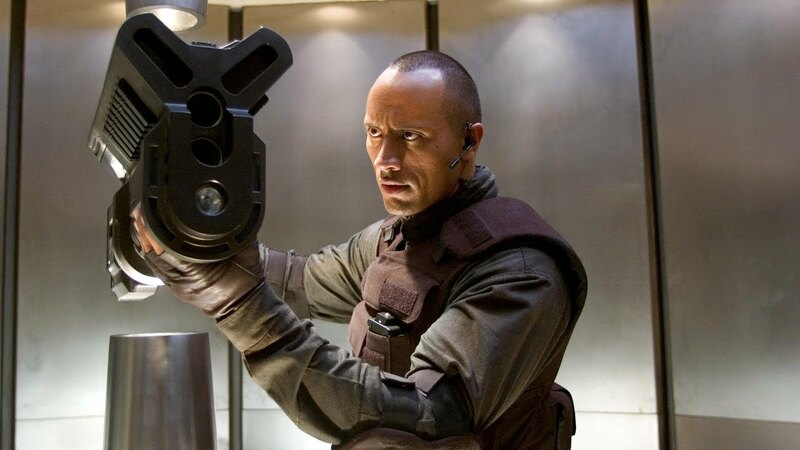 A group of Marines led by Sarge (Dwayne Johnson) and including Reaper (Karl Urban) are dispatched to investigate reports of carnage. At the research centre they team up with Reaper's twin sister Samantha (Rosamund Pike), who is one of the scientists conducting genetic experiments to replicate superhuman powers apparently perfected by an ancient but defunct civilization. The Marines fan out and soon stumble upon murderous monsters with super strength. As the Marines sustain casualties, tensions mount and it becomes apparent that the infected dead can rise again and cause havoc. Sarge is determined to annihilate all living things before evil is transported back to Earth, but Reaper and Samantha want to be more careful about who to kill and who to protect. The videogame Doom and its sequels reimagined what gaming can be, and became a worldwide phenomenon. Adapting a visceral first-person experience to the more staid movie screen was always going to be tricky, and the project predictably fails. Despite a fair effort from director Andrzej Bartkowiak, Doom the movie is often too dark, the action an incomprehensible blur, the monsters poorly defined. Too many minutes are burned with images of marines pointing their rifles and searching nondescript and poorly lit rooms, waiting for the next beast to emerge from the shadows. Still there are flashes of promise. The film hints at an interesting backstory involving the parents of Reaper and Samantha. And placing siblings rather than an awkward attempt at a romance close to the centre of the story is a welcome touch. The discussion of genetics, chromosomes and pathways of evolution would have generated more curiosity in better hands, while the conflict between the follow-orders Sarge and the more conflicted Reaper does build up nicely. But unfortunately the better moments are overtaken by repetitive forgettable firefights generating plenty of noise but clumsy, grainy visuals, and only the half-crazed Corporal Dean Portman (played with wild-eyed intensity by Richard Brake) registers from among the supporting cast of disposable Marines. Dwayne Johnson (credited under his wrestling name The Rock) and Karl Urban are all about muscular grimness, while Rosamund Pike, three years after her Bond girl debut, finds herself ankle deep in gore. Late on, Bartkowiak captures the spirit of the game with a fun first person perspective sequence in which Reaper finally gets mad and embarks on a wild monster killing spree. Otherwise, Doom is dour, dreary, and dank.